This shikargah (or hunting) sword has an important and fine blade. It is lightweight, with high contrast wootz steel and a subtle medial ridge that leads to a ‘spear-point’ tip. Its base is sandwiched between two openwork reinforcing mounts which are decorated with gold and depict an elephant boldly chasing down a tiger that has pounced upon a deer. Mounted in a silver-gilt basket hilt of small proportions, the silvering of the grip is a further indication of the richness of the piece as it would have typically been hidden by a covering of material. The hourglass-shape of the grip and the acute angles of its protrusions relates this to the Jodhpur type of hilt. The scabbard is probably 19th century in date, having a wooden core covered with green velvet and fitted with a copper-gilt chape and suspension loop with an openwork design. 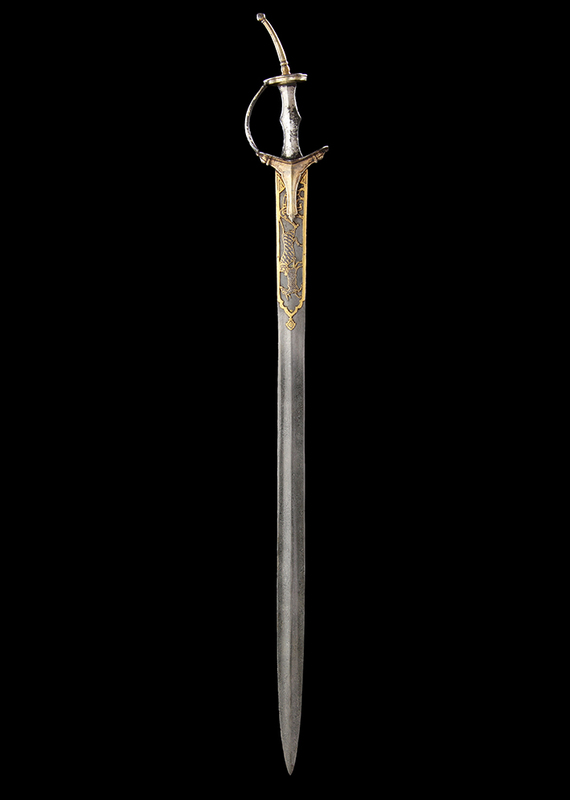 This piece is similar to two swords in the Jodhpur Fort, both of which are catalogued by Elgood and thought to have been of royal ownership—certainly, the quality of this example suggests the same. R. Elgood, Rajput Arms & Armour: The Rathores and their Armoury at Jodhpur Fort, Niyogi Books, 2017, p.503 and p.553.